Has this actually been in a comic? I don't know, superhero canon is impossible to keep track of. But if not, well, here's Superman and Green Arrow kissing like they mean it. Or at least like Superman means it. 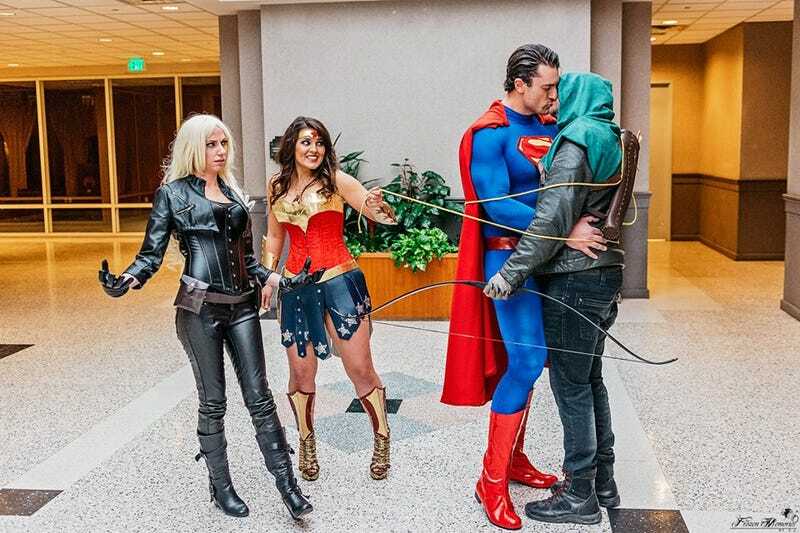 Black Canary is AlyCat Cosplay, Green Arrow is Epyon Merquise (Canary's fiancée IRL) and Wonder Woman is PhoenixForce85, who cosplays as a couple alongside Superman (Jesse) as the duo JessoLaurus Rex. Photo by Frozen Memories by CJ. Via Fashionably Geek.